I'm going to do something I don't do very often, here. I'm going to talk about a game I've only barely scratched the surface of. 7 Wonders: Babel is the fourth expansion for 7 Wonders. I say "fourth," but - really - it's the fourth and fifth expansions, because this box contains two separate expansions. The previous expansions - 7 Wonders: Leaders, 7 Wonders: Cities, and the Wonder Pack, all reinforce or accentuate what's already there in the base game. They're "more of the same" expansions. 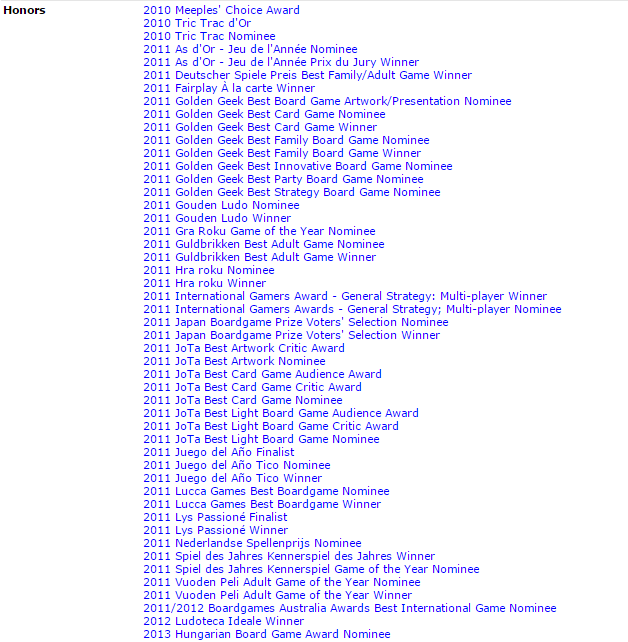 That's ... that's a lot of awards. 7 Wonders: Leaders added a preliminary draft before the first Age, and it added a Leader phase before each Age where players could play a leader. This expansion allowed players to start to focus their strategy before the game really began. It added a few new symbols to the mix, but didn't really shake gameplay up much. 7 Wonders: Cities added another color of card to the mix, and increased the maximum number of players to 8. The "big adds" in this set were team play, peace tokens, debt, and the ability to copy your neighbors' science symbols. The peace tokens allowed players to withdraw from the military phase, forcing their neighbors to fight each other instead. Players who went into debt lost victory points that couldn't be bought off later. The Wonder Pack added a handful of wonders to the game. Nothing new mechanically, but the wonders themselves were interesting and entertaining. What these expansions didn't do was allow players seated across from the table to interact. Now, I'm not saying Babel does this directly - but it definitely increases the interaction between players and the complexity of the game. Based on my limited play so far and the discussion I've seen online, this is going to be a love-it-or-hate-it expansion because of how much it changes the game. There are - as I mentioned earlier - two different parts to this expansion: The Tower of Babel and Great Projects, each of which include a number of new components. The Tower of Babel expansion is a Babel Board with three or four slots for Babel Tiles, depending on the number of players. Remember what you can do with your card each turn in the base game? Slide it into one of the spaces in your Wonder. Babel tiles are drafted at the beginning of the game, much like leaders. When played, they change play for everyone at the table. And they have a wide variety of effects: Some of them increase or decrease the costs of playing certain cards. One of them decreases the points earned for military victories. Several of them cancel out the abilities of certain cards (Tile #3, for example, cancels the brown Double Resource or Split Resource cards, and is a truly evil tile to play during Age III). A couple of them provide free resources. Depending on the number of players you have, there are only three or four slots available for tiles. New tiles go on top of old tiles. Once a tile is covered, its effects stop. If multiple players build Babel tiles during the same turn, then they are place in ascending numerical order. Our first game with the Tower, it severely reduced our final scores. We weren't sure what to expect, and spending a turn playing a tile to potentially set up future points cost us time. Every turn spent building Babel is a turn not spent building your own city. Not only that, but the afore-mentioned Tile #3 showed up during Age III, and so most of the third age of the game was players discarding for coins because they lacked the ability to build anything else. The other half of the expansion is the Great Projects, which are a handful of large cards. The game includes five per age. These are shuffled and one is turned up each Age. You then place a number of wooden "Participation tokens" on the card equal to the number of players minus one. I've only played this part of the expansion once so far, and we goofed. So I can't say 100% how good it is. I liked it, but I want to play it correctly so I can judge it fairly. The Great Projects are things that everyone is cooperating to build. Each card has a reward, a penalty, and a cost to participate. In short, when you build a card of the appropriate color, you can pay the participation cost (which I believe is always gold) to the bank to grab a participation token. At the end of the Age (before the military phase), you check to see if all of the tokens have been grabbed. If they have, then the participants get a reward and the non-participants do not. If there are tokens left on the card, then the participants get nothing but non-participants are penalized. It's possible to have more than one participation token, at which point you get multiple rewards (if the project is completed). Rewards vary - you can gain money, increase your military power, get a free building in the future, get extra points for science or your wonder, and so on. The penalties can cause you to lose cards from your city, or lose money, or even lose your starting resource. If you can't pay a penalty, then you take penalty tokens and lose points. Unlike the Tower portion of the expansion, the Great Projects don't burn your turn, so they didn't hurt scoring. In fact, they helped my scoring when we played (I managed to reduce my opponents' military by enough points that I wasn't in last place). As I said earlier: I think this box will be a love-it-or-hate-it expansion. Since I like a bit of complexity, I think that - over time - I'll come down on the Love It end of the equation. But I'm also very aware that added complexity isn't for everyone, and this exact flavor of added complexity also won't be to everyone's taste. But I really like it, and am looking forward to the next set.